Roulette is one of the gambling games you can find in the casinos. To understand the art of winning Roulette, you start with recognizing the wheel types; the American double zero (00) wheel and the European Single zero (0) wheel which are differentiated by the order of numbers on the wheel. Also, the American version has an extra pocket (00). Various casinos offer betting terminals where you sit right before a computer screen and the winning number is dictated by the computer system, rather than a genuine roulette wheel. This is called RNG roulette; signifying “random number generator” roulette. Though the RNG is undoubtedly an amazing game to play at times, yet it is extremely harder to beat on long-run in light of the fact that it is only a computer animation with no pattern unlike the genuine roulette. You can only beat genuine roulette, including a genuine physical roulette wheel. Even though winning Roulette is widely believed to be all about luck, there are strategies that can be used to improve performances and in turn, maximise winning to a large extent. This article focuses on important advice for winning Roulette which is guaranteed to yield better results for anyone that adheres to them. Do not be in a hurry, first practice betting at a free table before attempting the real bet. This will help you get acquainted with the game and open your knowledge to know what works more; thereby improving your confidence level. Also, it is important to study the other player’s strategies of winning in order to adopt them in your own bets. Always predetermine the budget for your roulette bankroll and also have a clear definition of how you will manage the fund before you step into the casino. This will save you from making a catastrophic emotional decision either out of morale boost due to winnings, or the urge to recover a loss by all means. Always follow your money management pattern. For an instance, you only wager a percentage of your budget on one stake and increase your stakes as you win more or decrease your stake when you are losing. Also have a predetermine limit to payout profits when you are on winning streak. Try as much to understand all Roulette Terminologies before you start playing as this will ensure you don’t get confused each time a term is used. When you are ready to play at a table, review previous numbers that emerged from previous spins to be able to determine your best course of betting on the table. For an instance, if the last 5 to 10 numbers were all red, it will be advisable to bet on other color (e.g. black) as the probability of preceding numbers being black is getting higher. Try as much to study what happens at the physical wheel rather than the betting table. Albert Einstein once said that a roulette table cannot be beaten but never said such about the actual wheel. That comment was just pointing at the mathematical edges and scattered representation of the actual wheel. To be precise, mastering the wheel using scatters (a kind of measure to determine how predictable the ball bounce is) puts you in great advantage over the casinos. Whenever you have the opportunity to choose, play the European Roulette rather than the American Roulette. The American Roulette wheel bears an extra slot, 00, which decreases the chance of winning to an extent. The house edge on a European wheel is on 2.63% compared to American wheel which is about twice (5.6%) which gives them bigger advantage. Concentrate your betting on even money or outside bets i.e. Red or black, Even or Odd, High or low, Columns or Dozens. Even though this type of bet profits less due to the expected odds in roulette, the probability of you winning is higher and this can lead to more profits on the long-run. When playing online, be conscious of online casino site where you play your bets as there are many scams out there. 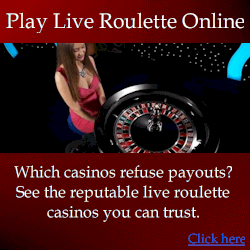 Ensure the site is reputable and associates with a reputable casino. Also make sure they use a random number generator because there are sites that will rig the computer system against you. Always try to verify all these. Try to adopt some various system of betting but do not use roulette systems that get you banned (example, arbitrage calculation system) as they are not worth it. Rather, concentrate on mastering the wheel and then using either of the accepted roulette systems like Martingale which involves doubling your stake in your next bet after losing the previous one thereby being able to recover your previous loss and make some profits simultaneously. Other roulette betting systems include Grand Martingale, Fibonacci, e.t.c. But you have to know that these betting systems all have their respective disadvantages; therefore you need to understand the pros and cons before using any of them. Finally, let experience be your best teacher; do not repeat a mistake twice. Always endeavor to put your emotions and feelings on check. Do not deviate from your original betting plan because of a swing of luck, slow and steady win the race. Following a betting plan makes you bet responsibly.